Moloka’i Ka Hula Piko began in 1991, and was founded by Kumu Hula John Ka’imikaua, Halau Hula O Kukunaokala and the Moloka’i Community. Celebrated each year in the early summer, it was organized as a cultural and educational event to be utilized as a vehicle to educate and enlighten all people of the undocumented, pre-western history of Moloka’i. 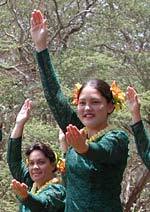 The Festival is unique and celebrates the many oral traditions of early Moloka’i that tell of the island as being the birthplace of the hula. 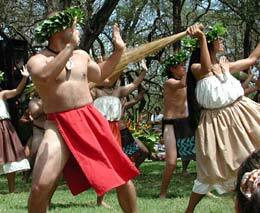 In pre-western Moloka’i mo’olelo (history), oral traditions mention the district of Ka’ana as the site where the hula began. Ka’ana is located on the heights of Mount Maunaloa, West Moloka’i. In the oral traditions of Moloka’i, a woman named La’ila’i, settled and made her home at Ka’ana on the hill Pu’u Nana. She brought with her the art of the dance, and introduced this unusual art form to the people. Her unusual art form influenced many to travel from the neighboring islands to Moloka’i, to behold the beauty of her dancing as nothing like it was ever seen before. For five generations after the passing of La’ila’i, the art of the hula was kept secret and only passed down to her descendants who performed their sacred dances only at Ka’ana. During the fifth generation of La’ila’i dancers, Laka was born into the La’ila’i clan and was taught the art of the dance by her older sister Kapo’ulakina’u. Unlike those family members before her, Laka chose to leave the Island of Moloka’i to spread the art of the dance throughout the islands against her families consent. Thus, the art of hula was spread throughout all of Hawai’i and Laka was remembered as the first woman of the dance until the present time. Each year, a cultural theme is chosen from certain aspects of ancient Moloka’i tradition. A former cultural theme for the 1995 festival chosen was entitled “Moloka’i Pule O’O”, which translates as “Moloka’i with its Powerful Prayers”.This was an ancient saying said in fear and wonderment of the powerful prayers of the Kahuna on Moloka’i. The educational aspects of the week of festivities prior to the main festival of that year centered on Kahuna traditions of ancient Moloka’i. Each year, lectures are given by Halau Hula O Kukunaokala at Kulana’oiwi at the open Halau during the week prior to the main event. Each lecture is different and centers on the cultural theme for that year. To further enhance the cultural quality of the festival, a cultural site is also chosen. The chosen site coincides with the cultural theme for that year. During the on-site excursion, historical mo’olelo of ancient Moloka’i are told. The on-site excursion is also free and open to the public. The Halau designs a special festival T-shirt each year, which centers on the cultural theme. Ka Hula Piko t-shirt designs are also utilized as cultural, teaching tools. Many traditional, pre-western Moloka’i kapa-patterns and geometric designs have been implemented to enhance the cultural quality of the shirts. A card explaining the mo’olelo and cultural meaning of the design accompanies each t-shirt. Three days of festivities are culminated by a grand Ho’olaule’a (celebration) with music groups from throughout Hawai’i, hula, food and craft booths. The food and craft people are venders who live on the island of Moloka’i adding to the festival a unique Moloka’i homegrown Hawaiian atmosphere.